The union representing immigration judges is pushing back against the Trump administration for undermining judicial independence after the Justice Department stripped a Philadelphia judge of his authority over 87 deportation cases, reports the Washington Post. Why it matters: This is a classic reflection of the growing rift between the Trump administration and immigration judges, who, unlike those under the judicial branch, have little protections to their judicial independence. 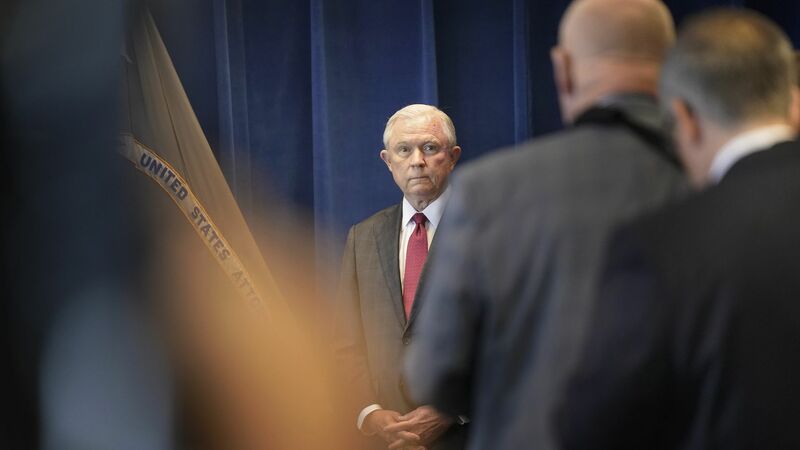 What's happening: The National Association of Immigration Judges filed a labor grievance this week in response to Attorney General Jeff Sessions' overriding of a judge’s decision and removal of dozens of cases involving undocumented immigrants. Judge Steven Morley was reportedly overseeing juvenile cases which he either continued, or placed on hold due to questions over whether attorneys at the Justice Department had duly notified defendants to appear in court. The backstory: The case that sparked the dispute involves a Guatemalan national who arrived in the U.S. in 2014 as a 17-year-old unaccompanied minor, and didn't appear before Morley. The Post reports that Morley temporarily closed the case and ordered DOJ to ensure Reynaldo Castro-Tum, whose whereabouts are unknown, had received his notice. Sessions, who reviewed the case in January after prosecutors appealed Morley’s order, said it must be reopened and resolved within two weeks. But the judge declined to rule against the juvenile, prompting DOJ to removed dozens of other cases from his docket this week. What they're saying: The union is urging DOJ to reassign the cases to Morely, and pleaded for judicial independence. "We’re very concerned the immigration judges are simply being turned into law enforcement officers," said Laura Lynch of the American Immigration Lawyers Association, per the Post. The federal law enforcement agency reportedly said Morley might have violated federal law and an investigation remains ongoing.